(MoneyWatch) Many of us work frequently with teams or clients scattered across the country or even the world, which makes scheduling a meeting or phone call outside of your home city problematic. 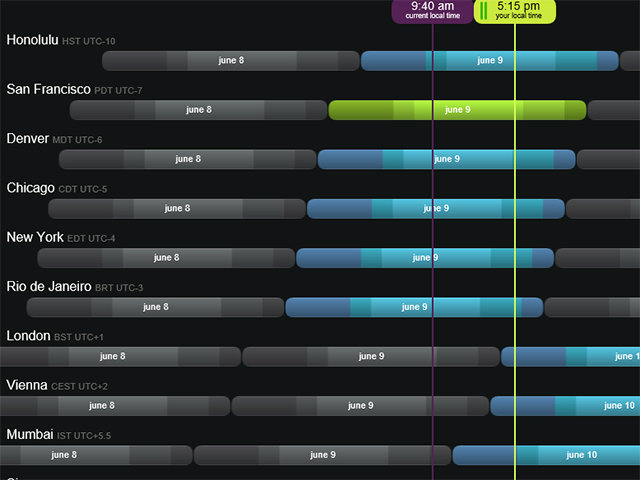 Recently, however, a friend showed me a clever site that makes time-zone scheduling a snap: Every Time Zone. This handy site displays the 13 most important international time zones. Just dragging a bar across the page -- comparable to using the control function in a music or video player -- will allow you to see what time it will be in each zone at any given moment. The horizontal time zones are color coded as well: Lighter colors represent more suitable times for meetings, and darker colors highlight very early and very late times of day. Finding a good time becomes an exercise in lining up the vertical bar so you're in the lightest part of the day in every time zone involved. The best feature allows for communication among participants about the meeting time. Once you've settled on an hour, copy the URL of the page. The Web address captures the exact time you've selected, so you can share the meeting time suggestion with everyone else exactly the way you currently see it on screen. Sometimes it's the simplest sites that are the most helpful. Every Time Zone stands to ease the pain of every remote meeting or phone call you need to make.